A snowmachine is a snowmobile. But to me, it will always be a snowmachine. That’s because in Alaska, where the devices are most used, everyone knows them by that name. In Alsaska, the snowmachine is all the reason you might need to get up there in the winter. The place becomes an ice planet with little sunlight, and it’s not hard to find entire hillsides crawling with snowmachiners. One of the best spots is Hatcher Pass, out in the Matanuska Valley, north of Anchorage. If you’re not quite prepared to go all the way to Alaska for your winter outdoor adventure, consider one of these five Lower 48 destinations that could make all your snowmachining dreams come true. West Yellowstone, Montana, near Idaho and Wyoming, is a fine place to roar off into the white on an expedition. With the help of Two Tops Snowmobile, riders can find their way to places such as the Old Faithful Geyser Basin and the Grand Canyon of the Yellowstone. 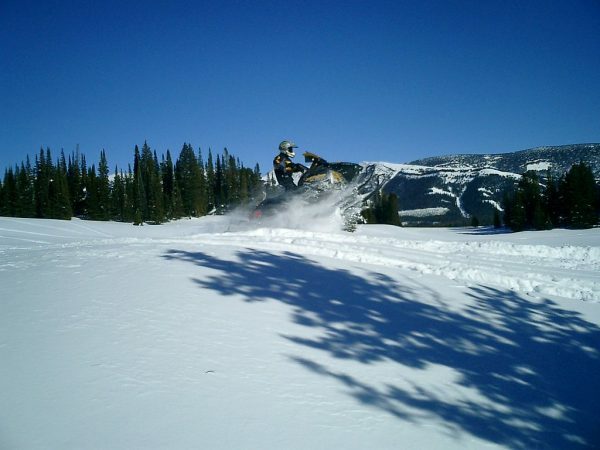 That company runs Ski Doo 4-strokes, and you’ll be able to climb to just over 2,000 feet above sea level. It seems like Yellowstone National Park is a rich environment for the winter snowmachine explorer. Bridger-Teton National Forest is considered a prime destination with 600 miles of trails. Togwotee Mountain Lodge is an excellent winter vacation HQ, and it helps virgin snowmachiners, while also hosting world-class drivers who fly in from around the world. So if you stay here, you might end up having some hot buttered rum with a snowmachining rockstar. Out here in Priest Lake, Idaho, not far from the Canadian border, Elkins Resort loves snowmachiners. The place maintains two trail heads throughout the Selkirk Mountain Range, and guests can hop onto them from their cabins. The well-maintained trails climb to 7,000 feet. You’ll find yourself in deep woods here, so bring your emergency kit for certain. Back in new England, Mount Snow in Vermont’s Green Mountains is an excellent spot. Snowmobile Vermont on Mount Snow offers guided tours along the Vermont State trail system. The Katahdin Region is a network of curated trails that stretch out more than 400 miles. Snowmachines are so ubiquitous here in the winter, local businesses offering snowmobile parking and repair shops. And the trails are maintained by volunteers from a host of snowmachine clubs throughout the state. Of course, another option is to just get a snowmachine and go somewhere with snow, but with a little planning, your adventure can be grand, and you’ll likely be in good company. We still recommend the Alaska experience, but it’s a bit of a drive to get there.